Since the end of March, the Financial Select Sector SPDR ETF (NYSEArca:XLF) has gained 3.4% to lead the way, while four of the other sector ETFs are in negative territory for the quarter. The S&P 500 index is up 0.8% in what has been a pretty lackluster second quarter up to this point. With the performance of the financial sector in mind, it was a little surprising to see so many financial stocks on my bearish scan last night. The XLF fund was one of the 14 financial ETFs or stocks that appeared on the list, and there were only a total of 27 names on the bearish list. If the fact that over half the list was financial stocks didn’t get my attention, the fact that seven of the top 10 holdings in the XLF were on the list certainly did. 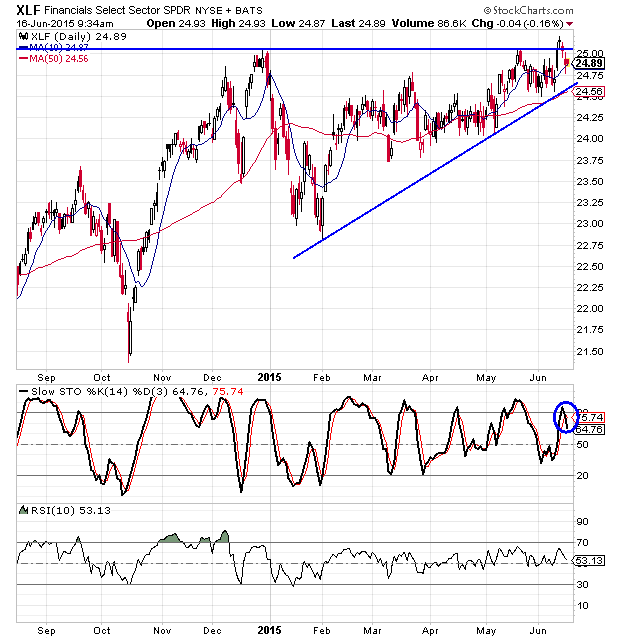 Looking at the charts for the XLF, there are a few things that stand out. The ETF has had some trouble getting through the $25 level. This area acted as resistance at the end of last year and then again last month. The XLF managed to move above the resistance for a few days last week, but it has now moved right back below it. And this happened as the slow stochastic readings made a bearish crossover. The other thing that stood out is how the upward sloped trendline and the flat line resistance are getting ready to converge, which tells me that the XLF could be setting up for a major move in one direction or the other. Which direction isn’t clear just yet. 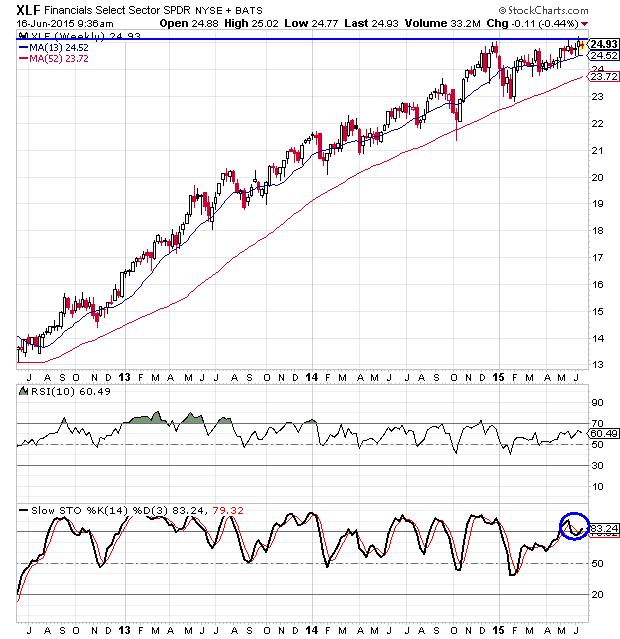 The weekly chart shows that the rally over the last few months has allowed the weekly stochastic readings to remain in overbought territory for most of the quarter. The only other thing that caught my eye on the weekly chart was how the XLF has only challenged its 52-week moving average twice in the last three years. Here is where it gets interesting for the XLF. The Federal Reserve’s policy meeting concludes Wednesday, with guidance on a potential hike to the federal funds rate expected to be announced at 2 p.m. EDT. At the beginning of the year, many analysts were pointing to the June meeting as the one where the Fed might raise rates. Those expectations have changed, and now most people are saying that the September meeting is the earliest we will see a change in rates. While most sectors aren’t looking forward to a rate hike, the financial sector would likely benefit from a hike. When rates rise, banks benefit from a larger spread between the loan rates they collect and the savings rates they pay out. If the Fed makes any indication that a rate hike is coming sooner than most think, the XLF should rally. However, if the Fed indicates that a rate hike is even further away than most people are thinking, the XLF would likely fall. My recommendation for now is to watch the chart to see which gives way first. If the XLF can break solidly above the $25 level after the Fed meeting, it could be primed for a great second half of the year. If the XLF breaks below the upward sloped trendline after the Fed meeting, it could very easily drop down to challenge the 52-week moving average and possibly break below it. The bottom line is I wouldn’t make a move in the next few days. I would wait until the end of the week or even next week to play the XLF. If the resistance gives way, I would go long, and if the trendline gives way, I would make a bearish play. This article is brought to you courtesy of Rick Pendergraft from Wyatt Research.